Low profile only 23mm deep. 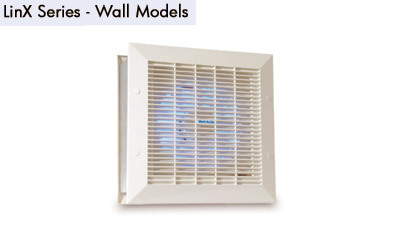 LinX Series commercial built-in wall fans are designed for flush mounting in all walls up to 300mm thick. Automatic operation with thermoactuated shutter and low profile grilles these units are ideal for heavy duty and prolonged use. 50mm flange width minimises the requirements for making good. 6" Wall extract fan with thermoactuated shutter. Can be retro-fitted into most leading commercial wall fan liners. Maximum pressure 50 Pa. Speed controllable using LINSC6. Wall hole size 263mm x 293mm. 9" Wall extract fan with thermoactuated shutter. Speed controllable using LINSC912. Maximum pressure 50 Pa. Wall hole size 364mm x 371mm. 12" Wall extract fan with thermoactuated shutter. Maximum pressure 60 Pa. Speed controllable using LINSC912. Wall hole size 409mm x 452mm.